TUNIS, Tunisia Tunisian authorities conditionally released one of the only men in custody for alleged links to September's attack on the U.S. diplomatic mission in the Libyan city of Benghazi, the latest blow to an investigation that has limped along for months. Armed groups assaulted the lightly guarded mission on Sept. 11 and killed U.S. Ambassador Christopher Stevens and three other Americans, but despite U.S. promises there has been little news of progress so far in bringing the perpetrators to justice. Ali Harzi, a 26-year-old Tunisian extradited from Turkey in October, was one of the only people actually detained over the attack and at the time Tunisian authorities said they "strongly suspected" he was involved. On Tuesday, however, his lawyer Anwar Oued-Ali said the presiding judge had "conditionally freed" Harzi the night before for lack of evidence. He must remain in the Tunis area to be available for any further questioning. U.S. officials in December lamented the lack of cooperation with the governments of Tunisia, Libya and Egypt in their ongoing investigation into the attack, saying most of the suspects remain free. In Libya especially, investigating the attack is difficult because authorities rely on the numerous militias made up of tens of thousands of young Libyans who took up arms against former leader Muammar Qaddafi. It is often difficult to draw clear lines between those providing security and those causing instability. In November the official in charge of Benghazi security was assassinated, and on Sunday the government announced that the investigator sent to look into his death has since been kidnapped. Libyan officials have largely remained silent on the course of the investigation in the ambassador's death, saying only that it is ongoing. Harzi was one of very few people in custody in relation to the attack, along with Jamal Abu Ahmad, a member of Islamic Jihad arrested in Egypt, according to U.S. officials. Oued-Ali, the lawyer, described the release as "correcting an irregular situation" because authorities never had any real evidence. He is still officially charged with membership in a terrorist organization -- a charge punishable by six to 12 years in prison.In December, FBI officials questioned Harzi for three hours in the presence of a Tunisian judge. The FBI has not commented on the results of the questioning, but Harzi's lawyer said they just asked if his client had any information about the attacks on the Benghazi mission as well as the assault on the U.S. embassy in Tunis three days later. 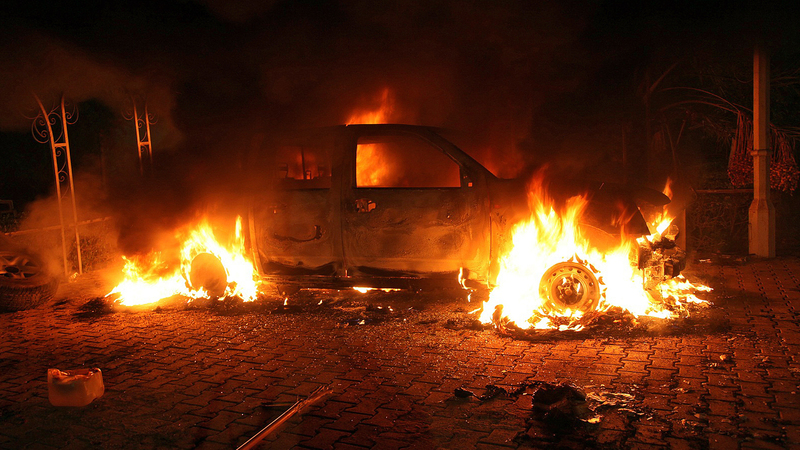 U.S. intelligence has blamed the Benghazi attack on militants who are members of a number of different groups. They range from the local Libyan militia Ansar al-Shariah, whose members were seen at the U.S. consulate during the attack, to militants with links to al Qaeda in the Islamic Maghreb -- al Qaeda's leading representative in the African region. The consulate's cameras captured many of the faces of armed men in a mob, and some have been questioned, but most remain free. In a recent TV interview, Harzi's father, Tahar, said his son was just working in Libya in construction supporting his family. Both Ali Harzi and his brother Brahim have had brushes with the law before, however. In 2005 the two were sentenced to 30 months in prison for having contact with another brother, Tarek, who fought against coalition forces in Iraq, according to lawyer Oued-Ali.